To educate, encourage and advocate for sufferers of adrenal disease. The Adrenal Alternatives Foundation accepts candidates for membership. All membership candidates must be approved by the founder. Members reserve the right to assist in charity projects, advocacy campaigns and educational endeavors. Members receive no compensation. Members may meet remotely via a digital communication platform during assigned meeting times. Planned meetings to be announced two weeks in advance. Section 1 — The Founder is responsible for overall policy and direction of the association and delegates responsibility of projects, campaigns and endeavors to board members and volunteers. The board shall have up to 10, but not fewer than 4 members. The board receives no compensation. Section 2 — Terms: All board members shall serve two-year terms, but are eligible for re-establishment of their position upon approval of the Founder. Section 3 — Meetings and notice: The board shall meet at least quarterly, at an agreed upon time. Meetings can be done remotely via an online communication source. An official board meeting requires that each board member have notice at least one week in advance. Section 4 — Board elections: During the last quarter of each fiscal year of the corporation, the founder of the foundation shall choose board members to replace those whose terms will expire at the end of the fiscal year. A board of directors must meet at least once during a fiscal year, this can be accomplished via a remote communication platform. 5 — Election procedures: New directors shall be appointed by the founder of the foundation. Directors so elected shall serve a term beginning on the first day of the next fiscal year. Section 6 — Officers and Duties: There shall be four officers of the board, consisting of a chair, vice-chair, secretary and treasurer. Their duties are as follows: The chair shall convene regularly scheduled board meetings, shall preside or arrange for other members/volunteers to preside at each meeting in the following order: vice-chair, secretary, treasurer. The vice-chair shall chair committees on special subjects as designated by the founder. The secretary shall be responsible for keeping records of board actions, including overseeing the taking of minutes at all board meetings, sending out meeting announcements, distributing copies of minutes and the agenda to each board member, and assuring that foundation records are maintained. Section 8 — Vacancies: When a vacancy on the board exists mid-term, the founder of the organization shall establish a replacement. Section 9 — Resignation and termination: Resignation from the board must be in writing and received by the founder. Board members will be terminated for inappropriate behavior or exhibiting actions that do not reflect the integrity of the organization. The founder reserves the right to dismiss any board member or volunteer at any time. Section 10 — Special meetings: Special meetings of the board shall be called upon the request of the founder. Notices of special meetings shall be sent to each board member at least one week in advance. Voluntarius- An individual appointed by the founder to oversee and assist in the completion of volunteer projects. This appointed person shall serve for two years. Duties include: organizing charitable events, assisting in distribution of donated materials and organization of special occasions. Educo- An individual appointed by the founder to oversee and assist in the completion of educational endeavors. This appointed person shall serve for two years. Duties include: organizing educational events, assisting in distribution of educational media, both digital and physical. Consolatione- An individual appointed by the founder to oversee and assist in the completion of emotional support projects. This appointed person shall serve for two years. Duties include: organizing events, assisting in distribution of encouraging resources, both digital and physical. Aurum- An individual appointed by the founder to oversee the financial aspects of the Foundation and to assist the secretary and treasurer in managing donations and all funds pertaining to the Foundation. Duties include: assisting in distribution of financial resources, assisting founder, treasurer and secretary, keeping records of all monies pertaining to the foundation. The founder reserves the right to appoint volunteers and members to specific committees in order to further the purpose of the foundation. A conflict of interest is an actual or perceived interest by an officer, board member/director, or staff member in an action that results in, or has the appearance of resulting in, personal, organizational, or professional gain. This foundation was created to educate, encourage and advocate for adrenal disease patients and was in no way founded to glean benefits from those who suffer from adrenal disease. All donations will be delegated to funding the necessary expenses of this foundation and to redistribute the resources to those in need. Should a person in the foundation be in need, that is not considered a conflict of interest and they will be helped accordingly. All adrenal disease patients shall have access to the help this foundation can provide, both members and non-members. Board Members, officers, volunteers and clients agree to indemnify and hold harmless the Foundation and those acting for or on behalf of the Foundation from and against any and all losses, claims, damages, expenses or liabilities of any kind, including court costs and reasonable attorneys’ fees, arising out of or related to the services performed hereunder, or any breach of any of the covenants, representations or warranties hereunder. The foundation is not a replacement for medical care and should not be used to replace any physician, medication or treatment. All advice, media, documentation or events proclaimed and performed by the Foundation shall not be held liable for any and all losses, claims, damages, expenses or liabilities of any kind, including court costs and reasonable attorneys’ fees, arising out of or related to the services performed hereunder, or any breach of any of the covenants, representations or warranties hereunder. The Foundation shall keep correct and complete records of account and keep minutes of all proceedings. A record of board members, volunteers, officers and Foundation members shall also be kept by the appointed secretary. Detailed records of all Foundation events and projects shall be recorded. Fiscal Year for the Foundation beings on January 1st and shall end of December 31st. Any proposed amendment(s) must be submitted for review to the founder and executive director. Following their review, the proposal will be discussed before the board and officers; decision to be made after 30 days of careful deliberation and contemplation. The proposal will be presented at the next general meeting for a vote. All Foundation participants shall adopt bylaws, consistent with this Agreement, governing procedural matters including the conduct of its meetings and those of the other Principal Committees. If there is any conflict between such bylaws and this Agreement, the conflict shall be brought before the board of directors, executive director and founder for resolution. The undersigned majority of whom are citizens of the United States, do hereby submit these Articles of Incorporation for the purpose of forming a nonprofit corporation. 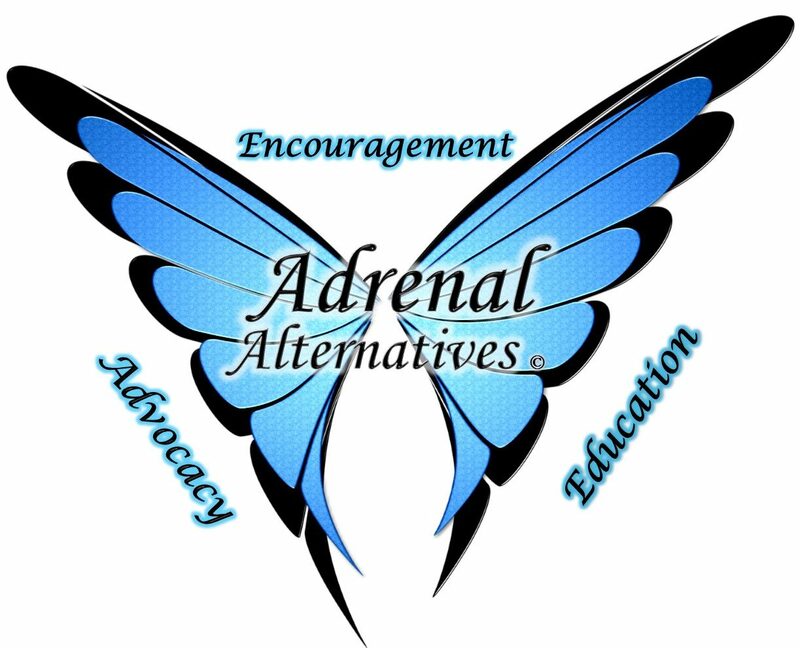 To Educate, Encourage and Advocate for all sufferers of adrenal disease. The corporation shall have perpetual existence to educate, encourage and advocate for all sufferers of adrenal disease. The effective date of incorporation shall be: upon filing by the Secretary of State. The corporation is not for profit and a Public Benefit Corporation. The corporation does indemnify any directors, officers, employees, incorporators, and members of the corporation from any liability regarding the corporation and the affairs of the corporation, unless the person fraudulently and intentionally violated the law and/or maliciously conducted acts to damage and/or defraud the corporation, or as otherwise provided under applicable statute. The Adrenal Alternatives Foundation was created to provide adrenal patients with as many resources as possible to manage adrenal disease. The Foundation seeks to provide hope and healing to all board members, officers, volunteers, clients and anyone associated with the Foundation. The Foundation will use physical materials/donations, emotional support and educational resources to help all whose lives have been impacted by adrenal disease. The character and essence of the corporation is to educate, encourage and advocate for adrenal disease sufferers. The Founder reserves the right to dismiss any board member, regular member, volunteer, client or volunteer at any time if they engage in any activities or exercise any powers that violate the integrity or disturb the furtherance of the purposes of this foundation. Upon the dissolution of the corporation, after paying or making provisions for the payment of all the legal liabilities of the corporation, assets shall be distributed for one or more exempt purposes within the meaning of section 501(c)(3) of the Internal Revenue Code, or the corresponding section of any future federal tax code, or shall be distributed to the federal government, or to a state or local government, for a public purpose. Any such assets not so disposed of shall be disposed of by a court of competent jurisdiction of the county in which the principal office of the corporation is then located, exclusively for such purposes or to such organization or organizations, as said court shall determine which are organized and operated exclusively for such purposes.